The bottled chewing gum cannot be wrapped up like the ones with paper package. The popularity of bottled chewing gums is accompanied by people ‘having to’ pollute the environment. 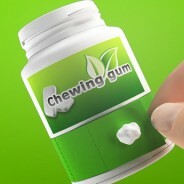 Therefore, I designed a kind of gum bottle that can help people package chewed gum and throw away later — an invention that help people achieve their environmental-friendly selves.